After the war, the communist government ruled the country with an iron grip and usually I was mistaken for a Russian, as they were the only foreigners allowed. 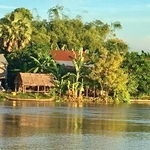 Of course all that’s now changed and these days, although it’s still communist, the government is keen to present a more friendly face for both north and south Vietnam and is doing its best to attract tourists. So much so that, at the moment, if you’re British, you can get a visa on arrival and immigration is a breeze. I start my South Vietnam trip in Ho Chi Minh City or Saigon, as it’s known to the locals, and Vietnam Airlines flies direct from London. Coming out of the airport, to greet the early morning rush hour, I see that the seas of bicycles I remember have now been replaced by thousands of scooters, some containing entire families. 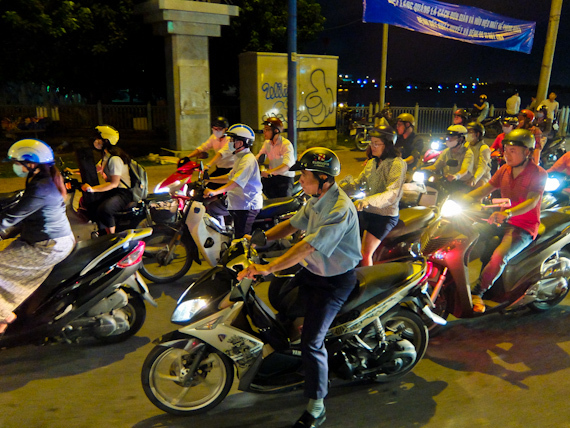 At first sight the legendary charm of Saigon seems to have been replaced by a bustling modern city, dogged by construction work and traffic fumes. 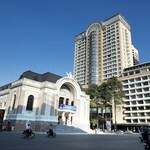 However, as I settle in to the Park Hyatt Saigon and explore on foot, I begin to get a sense of the colonial past. The Continental Hotel, where Graham Greene set the Quiet American, still exists, although the few forlorn tables on the terrace are a sad reminder of what it used to be. Other locations from the novel have been demolished but still going strong is the rooftop bar at the Majestic Hotel offering stunning views over the city, perfect for a sundowner. 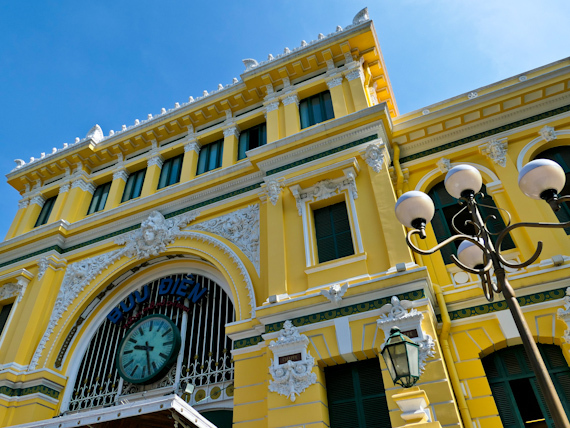 Buildings from the French period include the central Post Office, with its counters now dominated by a portrait of Ho Chi Minh, and the large Notre Dame cathedral, built out of red brick. Of course they don’t want you to forget the Vietnam War and there’s plenty to see. 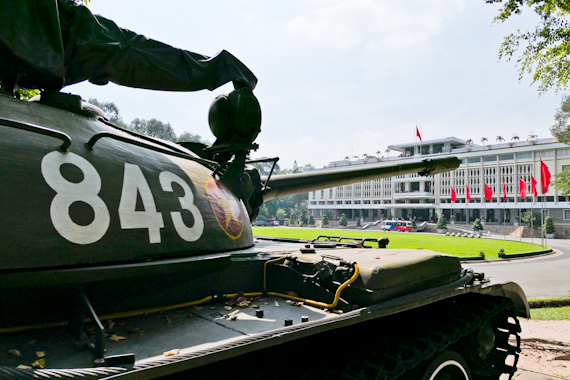 The former Presidential Palace has been left as it was when the Vietcong tanks smashed through the gates and the same tanks still stand guard. What they call the War Remnants Museum also has a clutter of military hardware in its grounds and its three floors tell the grim story of the years of war. There’s a market where they sell military memorabilia including discarded zippo lighters and dog tags. A trip out of town will take you to the Cu Chi underground tunnels where Viet Cong soldiers hid before launching their offensive. 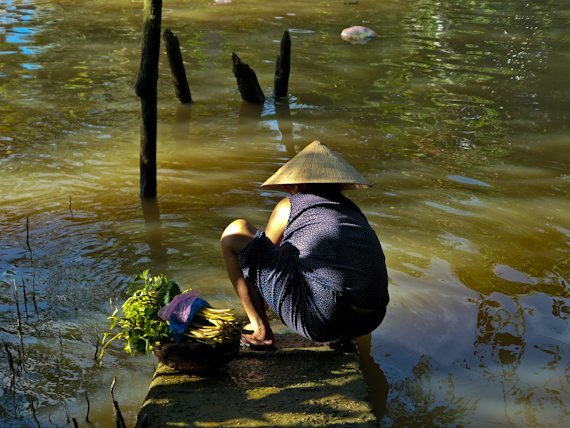 After two days, I set out into the Mekong delta, past miles and miles of green paddy fields. 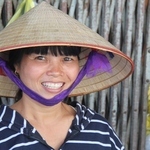 This is really the rice bowl of Vietnam with as many as three harvests a year. A three hour drive brings me to Can Tho, the provincial capital, on the southern banks of the Hau River.and I check in to the Victoria Can Tho. 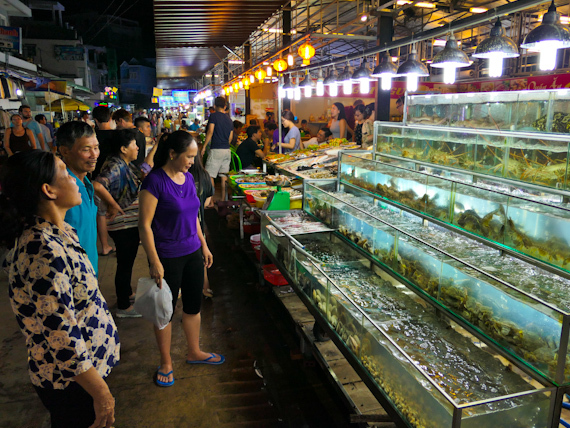 The busy waterfront is home to a selection of floating restaurants and there’s a vibrant night market. Even better, as the sun goes down, a whole host of stalls selling street food pop up and I get a tasting before dinner. 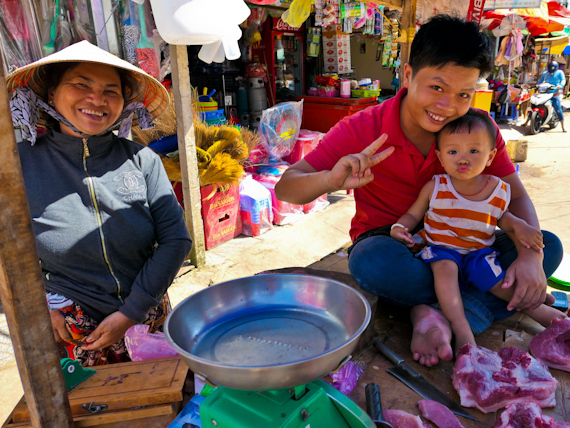 Next day, at dawn, I take a boat along the busy Ninh Kieu waterway to Cai Rang Floating Market where the bartering is already in full swing. People live on the water here and the houseboats are piled high with whatever they have to exchange. I see a canoe stuffed with pineapples pulling up to one full of watermelons and watch as they complete their exchange. Ironically the tourist boats seem to outnumber the local craft and it can’t be long before this way of life disappears forever. 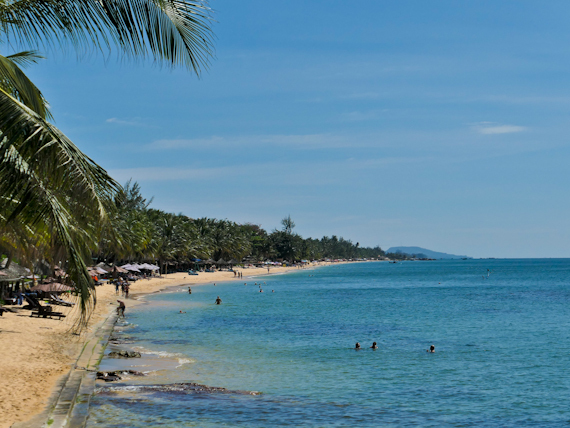 In the afternoon I take a 50 minute flight south to the island of Phu Quoc, situated in the Gulf of Thailand, closer to Cambodia than Vietnam. Here you’ll find long stretches of palm fringed golden sandy beaches, untouched jungle and abundant marine life in the tiny islands off the coast. New hotels are going up all over the place and the government has high hopes of it becoming the Vietnamese equivalent of Phuket. Certainly, sitting on sitting on the Hotel La Veranda terrace on the aptly named five mile Long Beach, watching the sunset, I can understand why they’re keen to promote it. The capital, Duong Dong is a sleepy little fishing town by day, but there’s a vibrant night market, really just a street of stalls displaying whatever they’ve caught that day. As well as fish there are prawns, lobster and octopus and they’ll cook it for you with rice or noodles, whilst you sip a cold beer. 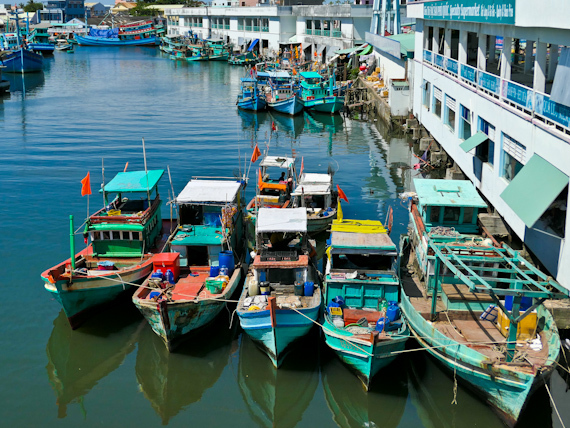 In other parts of the island, fish is laid out to dry in the sun and then fermented in barrels to make pungent fish sauce, renowned throughout Vietnam. 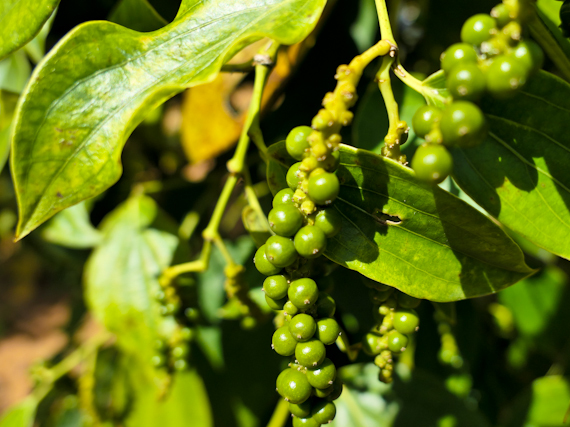 Peppercorns, first green then black when dried, are another quality product and pepper groves line the side of the roads where stalls allow you to taste and buy. The government also wants to make the island a base for eco-adventures, although at the moment jungle access is difficult. A network of trails is in preparation including one to the top of the 603m Mount Chua, Phu Quoc’s highest peak. I’m limited to a trip to the waterfalls at Suoi Tranh, about 5 miles south east of Duong Dong. They’re inside a government nature park, complete with life-sized concrete elephants and other African animals, lining the path. Another bizarre attraction is the prison camp, dating back to the 1970’s when the island was home to 40,000 enemies of the state. It’s been preserved exactly as it was and there are life-sized lurid cameos depicting guards torturing their captives. You can watch them extracting fingernails, administering electric shocks and whipping the prisoners, among other gruesome delights. Of course you don’t need to visit any of these and my suspicion is that they’ll be quietly phased out as Phu Quoc becomes more developed. At the moment luxury hotels line the beaches, right next to wooden shacks offering barbecued fish and cold beer. What I like about this arrangement is that it means you’re not limited to eating and drinking in your hotel, and can just stroll next door for something a bit livelier and certainly cheaper. Vietnam Airlines offers the UK’s only nonstop flights to Vietnam, with daily Dreamliner services from Heathrow T4 to Hanoi or Saigon. Experience Travel Group (0203 468 6268) can tailor-make 7 night holidays to South Vietnam from £2,101 per adult, including 2 nights at the Park Hyatt Saigon, 2 nights at the Victoria Can Tho, 3 nights at La Veranda, Phu Quoc, including daily breakfast, a Saigon city tour, private guides and transfers and return flights with Vietnam Airlines.